The poppy (Papaver rhoeas L.) is an ancient flowering plant, long desired by gardeners in a range of landscape situations. Learning how to grow poppies allows you to use their beauty in many flower beds and gardens. Planting poppies is simple and rewarding when their single and double blooms appear in cooler seasons. Growing poppy flowers are said to spring up on ravaged battlefields, as long ago as the 12th century. White poppies appeared on battlefields left by Mogul warrior Genghis Khan and were sighted in war zones following some battles of World War I. Thus, they have come to symbolize death and rebirth. The red poppy symbolizes fallen warriors and commemorates Veteran’s Day in the United States. Growing poppy flowers have been used for medicinal and culinary purposes over the centuries. The seeds of the poppy are currently used in flavoring for breads and cakes and for the production of poppy seed oil. Growing poppy flowers can be as simple as planting seeds or dividing roots of existing plants. Plant poppies from seed into poor to average soil in a sunny location for a good start to growing poppy flowers in your garden. Poppies grow from a taproot. When this taproot is disturbed in transplanting, a lost season of bloom may occur when planting poppies. 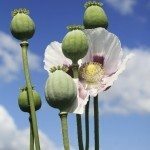 Divide poppies in autumn to allow time for the taproot to restore itself. Planting poppies in either way can provide attractive foliage and large or diminutive flowers in your garden, flower bed or meadow. Poppy plant care involves the deadheading of spent flowers, resulting in more prolific blooms of the poppy plant. Poppy flowers need limited watering once they have settled into their location. Too much water can result in tall, leggy, unattractive growth of the growing poppy flower. Choosing the variety of poppy best suited for your garden is an intriguing garden chore. The Armenian poppy is among the smaller and more delicate offerings. Oriental poppies offer the largest and showiest blooms but may die back during summer heat. California poppies self seed abundantly and should be planted where more poppies are desirable. Learning how to plant poppies correctly provides you with a striking choice for many sunny locations where soil has not been enriched or amended.